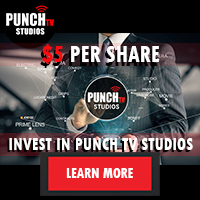 PUNCH TV STUDIOS - is a production and broadcast company committed to producing unique high-quality films and television programs (our “Content”) through our state-of-the-art production studio. Our core business model is to license and distribute our content to broadcasters and distributors all over the world. The Studio consists of: Syndication- The licensing of the right to broadcast televised programs. Merchandising- The enterprise of promoting the sale of goods. Production- The construction of Movies and Television Shows. Licensing- The certification of major productions with the intent of being broadcasted. Broadcasting and Network- The distribution of televised content over a system of interconnected televised stations. Music- The manufacturing of audbibles. This fully integrated approach is ushering in a new era of how television networks deliver programming and advertising messages to consumers. Through this new approach, Punch TV Studios ensures that its partners will benefit from the intensity of advertising that is guaranteed to saturate viewers with the message of its sponsors. Earn $250 per successful referral. Roku Digital Video Player - The Roku Digital Video Player is Netflix Members' #1 Rated Streaming Device and voted Engadget's Home Entertainment Device of the Year! And now you can join the revolution in home entertainment as an affiliate for Roku.com. The Roku player is like having your own video library at home with over 50,000 choices – from the best movies, TV shows to sports. The Roku player is the easiest way to watch anything and everything from Netflix, Amazon Video On Demand, MLB.com, Pandora and more instantly on your TV. The Wall Street Journal, CNET, WIRED, and other publications have given the Roku player overwhelmingly positive reviews. Now there’s a Roku player to fit every budget starting at $79. Earn 5% commission on sales. SkyStream TV - With SkyStream TV you get more channels than ever for only $35 a month! Enjoy more shows, the latest dramas, comedies, movies and now music and documentaries too. Catch every moment of breaking news, sports and other live events. Watch what you want, when you want, how you want. It's Your TV, Your Way! No contracts! No installation guy! No extra fees or charges! No useless channels and no pushy salesman! Cancel anytime online! You will receive $5 the first month you sign up a paying subscriber and $1 a month for as long as they keep their subscription. This payment structure allows you to build up a monthly income that gets bigger and bigger each month as new users sign up from your affiliate link! STARLINE TOURS - is the oldest and largest sightseeing tour company in Los Angeles, California, offering Hollywood Tours, Los Angeles Tours, the world famous TMZ Tour*, tours of stars' homes, shopping tours, beach tours and so much more!. We are the #1 Celebrity tour company and we pick up from over 250 hotels across the city! Our popular Hop On Hop off is in 100 cities worldwide, on every continent, and the largest in the world, making STARLINE TOURS very recognizable and trusted by travelers internationally! When you partner with us you will be promoting a very trusted and well known brand in the travel industry. Benefits: STARLINE TOURS' reputation, the success of our tours and sightseeing services and the extensive line of tour packages we offer means there is huge commission potential for you! We offer 10% on all of our Hollywood-based Tours which do not include admission fees to local attractions or theme parks. For Hollywood-based Tours which do include an admission price to local attractions or theme parks, we offer 10% of net. Things From Another World - is the online store for the Things From Another World retail chain, with 6 locations at Universal Citywalk, the Sony Metreon in San Francisco, and Portland, Oregon. They offer thousands of top rate products - movies, comics, toys, and collectibles - that are sure to please even your most discriminating visitors. Earn 7% commission on sales. Ticket Bureau - is specialized in the sale of tickets for sport, music and cultural events ever since 2001. We also offer packages and travel arrangements to complement users experience. We are the official ticket agency for the biggest European football teams: FC Barcelona, Atlético de Madrid, Manchester United, Manchester City, and Real Madrid Hospitality VIP. We are also the official agency for other big Spanish football clubs like RCD Espanyol, Málaga CF or Getafe CF. We guarantee our customers the availability of tickets for all matches, with tickets coming directly from the football clubs themselves. We also offer VIP ticket-packages for companies and individuals. We also offer our customers tickets for the most important festivals and concerts both in Europe and overseas. Earn 9% commission on sales. TicketCity - offers tickets for sports, concerts, and entertainment events around the world. While we buy and sell tickets for all events, it's our service that makes the difference. We're a business powered by people. Our knowledgeable team makes finding the right tickets quick and easy. Our friendly staff is always there to assist with any questions. It's our mission to provide clients the ultimate ticketing experience with a personal touch. Earn 1.5% Commission - Coupon Sites; 3% Commission - Loyalty Sites; 7% Commission - Content Publishers. Tickets.Cheap - sell sports, music, comedy & theatre tickets. As the name says, they sell them cheap. Earn 8% commission on sales. Turner Classic Movie Store - The Official TCM Shop offers a wide selection of classic movies, new releases and collectible merchandise anywhere, and we hope that you enjoy promoting with the benefits below. Register with the TCM Shop Affiliate program to receive and promote: Insider information on new DVD releases, including limited edition “Vault” titles you won't find in stores. Competitive commission rate through the Google Affiliate Network. Special discounts on classic movie merchandise such as books, soundtracks, and gifts & collectibles. Priority alerts on thousands of hard to find products for the classic movie enthusiast. Exclusive promotional offers . Find all products from your favorite classic movies and television programing. Earn 8% commission on sales. Warner Brothers Shop - is the official shop of Warner Bros. Studios. Find Great Deals on DVDs, Blu-ray discs, Warner Archive DVDs, Warner Bros. Clothing and Accessories, Collectibles, iPhone Cases, Toys and Games, Jewelry, Home Decor & more. WBshop offers the widest selection of official and exclusive merchandise for Harry Potter, The Lord of the Rings, Batman, Superman, Scooby-Doo, Looney Tunes, Vampire Diaries, and more. Whether you're looking for The Lord of the Rings Extended Edition Blu-ray, Harry Potter DVDs, Warner Archive New Releases, Harry Potter wands, the Arwen Pendant, Batman T-Shirts, Hermione's Time-Turner, Harry Potter Chess Sets, The Lord of the Rings Chess Sets, or Harry Potter iPhone Cases, you'll find them all at the Warner Bros. Studio Store online, WBshop.com. Join the Warner Bros. affiliate program today and earn 7% to 10% commission on each sale, from any one of our websites! Program includes 5 sites: WBShop.com – TV shows box sets, new releases on DVD and Blu-Ray; HarryPotterShop.com – Exclusive site for Harry Potter merchandise; HobbitShop.com – Exclusive site for The Hobbit merchandise; ShopDCEntertainment.com – DC Comics, Vertigo and MAD Magazine collectibles; Shop.WarnerArchive.com – Never before released classic features;. Commission start at 7% o sales value and rise quickly to `10% as your sales rise.